Neil Hopkinson, a professor of mechanical engineering at the University of Sheffield in the United Kingdom, has been developing the new method, called high-speed sintering, for over a decade. Laser sintering machines build objects by using a single-point laser to melt and fuse thin layers of powdered polymer, one by one. Hopkinson replaced the laser system, which is both expensive and slow, with an infrared lamp and an ink-jet print head. 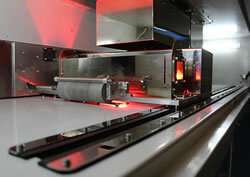 The print head rapidly and precisely delivers patterns of radiation-absorbing material to the powder bed. Subsequently exposing the powder to infrared light melts and fuses the powder into patterns, and the machine creates thin layers, one by one—similar to the way laser sintering works, but much faster.